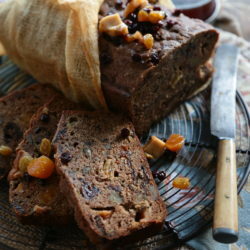 This brandied fruit cake is a family tradition. 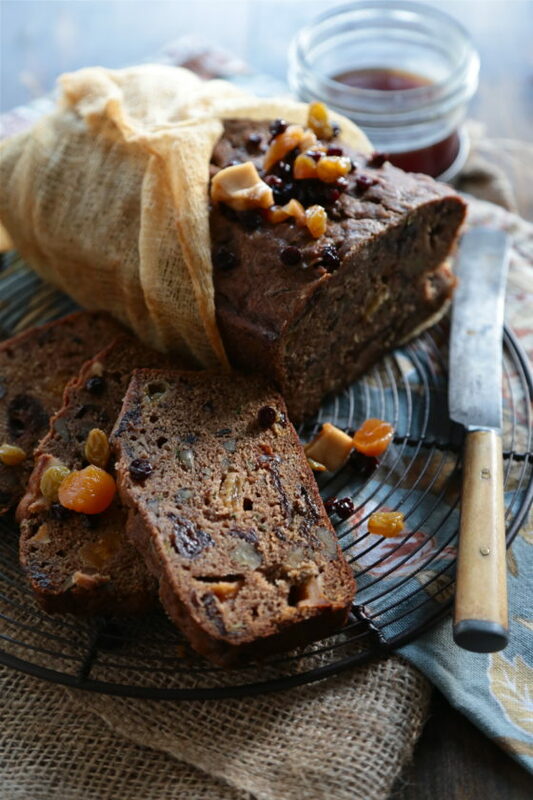 Packed with real dried fruits, and loads of brandy, this will make you and your family a believer in real fruit cake! I’m making it a personal mission to change the world’s mind about fruit cake. No, this isn’t your great aunt Nina’s technicolor fruit cake with those horrendous candied things that call themselves fruits – this is the real deal here friends. As a family, we don’t usually give gifts – instead opting for cards and a few homemade treats along the way. This brandied fruit cake is the most coveted of baked goods during the holiday season, and if you’re lucky enough to receive it you are indeed a very special person. As hoaky as it sounds, creating things and baking for others is how I show my love – it is my love language. This fruit cake speaks to me on a very emotional level… and with that I have gone off the deep end. But there are a few secrets you will need to master this ever-so-perfect fruit cake. And it includes a full fifth of brandy. Intrigued? Thought so! 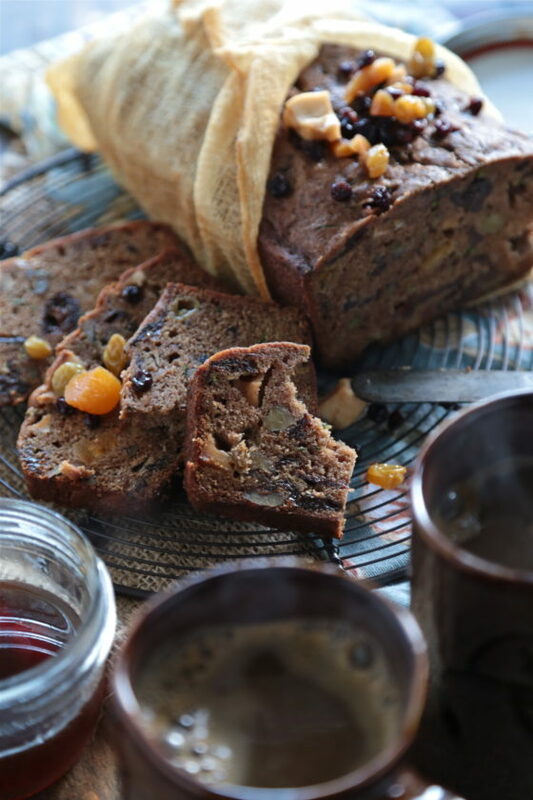 This recipe will take time, but rest assured if you start it now, you won’t be sorry when you’re sitting by a fire this Christmas surrounded by those dearest to you and a slice of this will brandied cider in one paw and a slice of this fruit cake in another. The origins of this recipe come from my step-dad’s neighbor, long before our families merged, and since then (nearly 25 years) it’s remained a tradition in our merged home, and now it is a tradition in mine and Ben’s. The process does take time, two weeks from start to finish to get the perfect age on the bread. Yes, it is aged! Start now, and you’ll be ready by Christmas. Combine all the dried fruits together in an airtight container, and cover the fruits with brandy to soak. Lots of brandy folks. Twirl and shake the jar to mix the fruits and ensure all the fruits are equally soaked overnight. If you are a real rebel, you can soak it for a week or more! When you are ready to bake the bread, drain the fruit and brandy and make sure to save the brandy syrup to pour right into your wintery hot ciders and toddies. It’s otherworldly. You can pour the brandy syrup into a glass mason jar and store it in your fridge. It will keep for a long time. Enjoy this recipe, from my family to yours! I hope it takes its place among your family traditions, too. 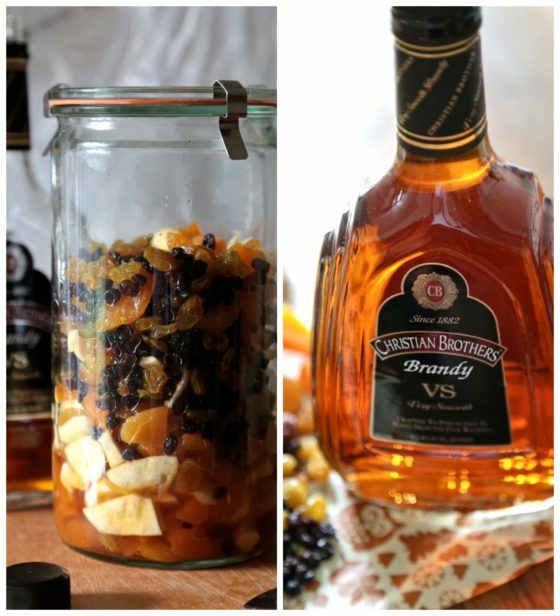 In a large airtight container, soak all dried fruits in ¾ cup Brandy. Marinate over night, turning fruit frequently to ensure it is all evenly marinated. In a large bowl, whisk together eggs, oil, brown sugar, and vanilla. In another large bowl, whisk together flour, cinnamon, baking soda, baking powder, allspice, salt, nutmeg, cloves, and salt. Combine flour mixture into the egg mixture and stir to combine. Stir in the remaining shredded zucchini, walnuts, pecans and drained brandy soaked fruits. NOTE Save the remaining brandy from the fruits – makes EXCELLENT hot brandy cider! Prepare 2 loaf pans, spraying with non-stick spray and lining with parchment paper. Divide the dough between the two pans. Bake for 60-70 minutes, or until a toothpick comes out clean. As loaves cool (in the pan), sprinkle each loaf with 1 Tbsp of additional Brandy. Cut cheesecloth to wrap each loaf. Pour some brandy into a cup and soak cheesecloth. Wring our cheesecloth of excess brandy. Wrap around each loaf with soaked cheesecloth. Place wrapped loaves in a double layer of aluminum foil. Store in a cool, dry place. Check cheesecloth every week, to ensure the cheesecloth has not dried out. Unwrap each loaf weekly and sprinkle about 1-2 tsp of additional brandy on the loaves to keep moist.